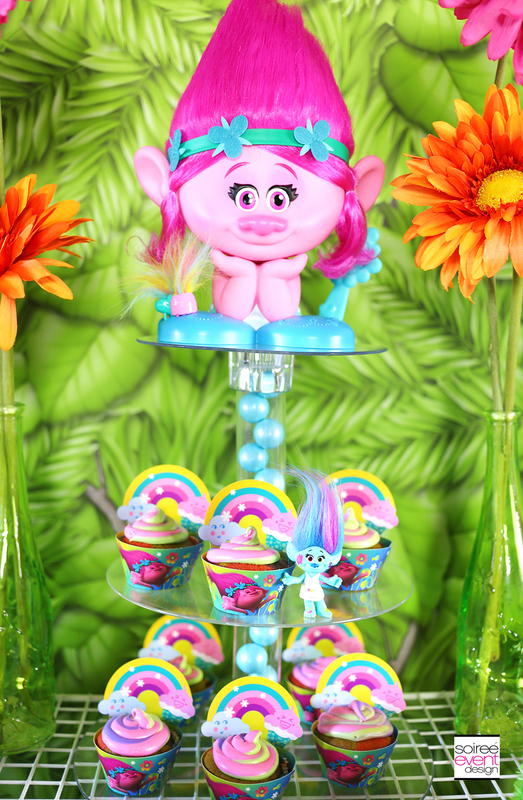 TREND ALERT – Host a Trolls Party with these Trolls Party Ideas! Hey party peeps! HAVE YOU SEEN THE NEW TROLLS MOVIE YET? It is such an adorable movie and unless you’ve been living under a rock, you have seen Trolls EVERYWHERE! It is all the rage right now! 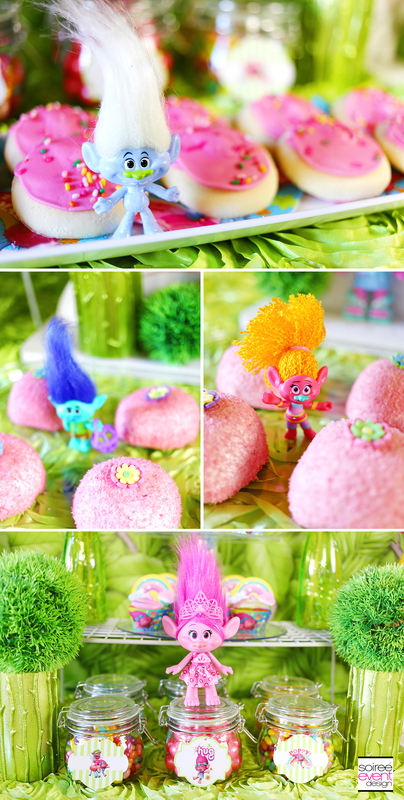 So, anticipating that Trolls themed parties will be super popular this year, I’m excited to share with you my TREND ALERT on how to HOST A TROLLS PARTY WITH THESE TROLLS PARTY IDEAS! CLICK HERE for all the details and a SHOPPING LIST of most of what I used so you can recreate this party yourself! Gotta LOVE that! Scroll down for links to my other posts with step-by-step tutorials, DIY crafts and a recipe to make your Trolls Party easy to plan! 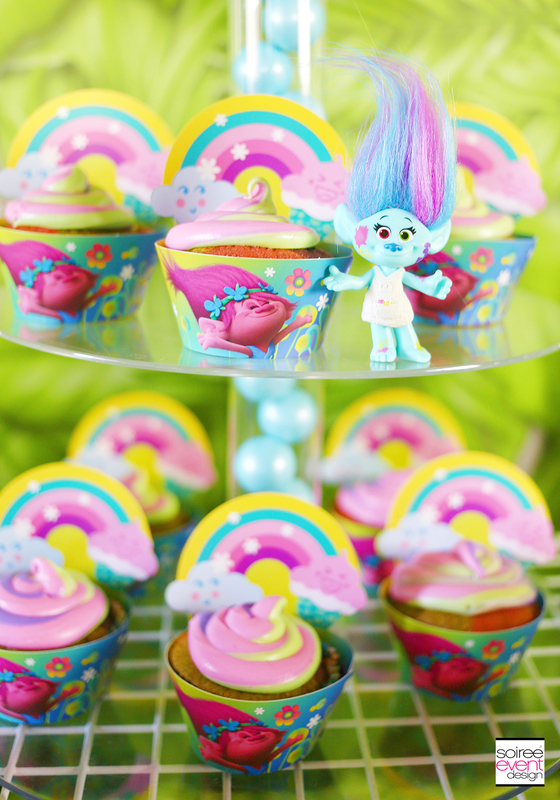 SET THE SCENE – TROLLS PARTY IDEAS! This party is a must-see! If you’ve seen the movie, you know it is full of GLITTER and vibrant bright colors, so of course, using big, bold colored flowers, plants and garden decor is important to set the scene. My biggest tip is to use Trolls Toys to set the scene! 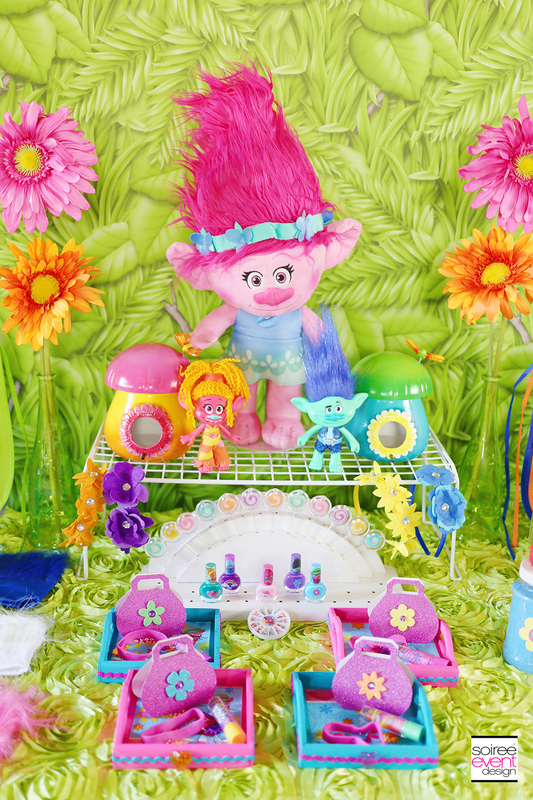 If you are hosting a Trolls Birthday Party, the Trolls toys could double as party decorations and gifts for the birthday girl! To create a forest environment for a Trolls Party, I started with this Tropical Foliage Paper Roll and used it on the wall as a display table backdrop. GIRLFRIEND TIP: One roll of the paper is 4ft x 12ft so you will have enough to cover the back of two 6′ tables. GIRLFRIEND TIP: Using Trolls Stickers and other embellishments will allow you to create your own Trolls themed decor items at a fraction of the cost. 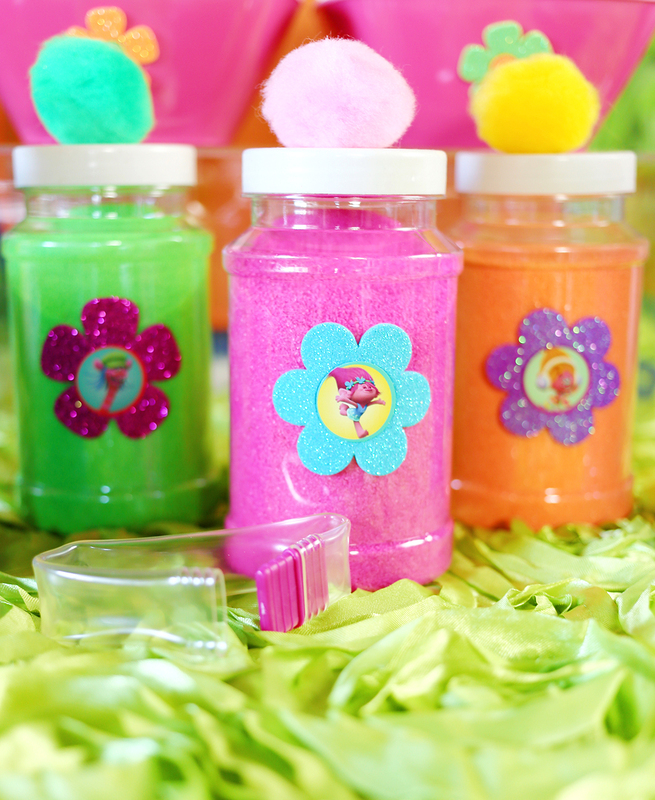 Instead of trying to find Trolls craft sand, I embellished the front of plain craft sand containers with inexpensive glitter flower foam and Trolls stickers then glued Pom-Poms to the lids so they matched the party theme. CLICK HERE for more party details and shopping list. 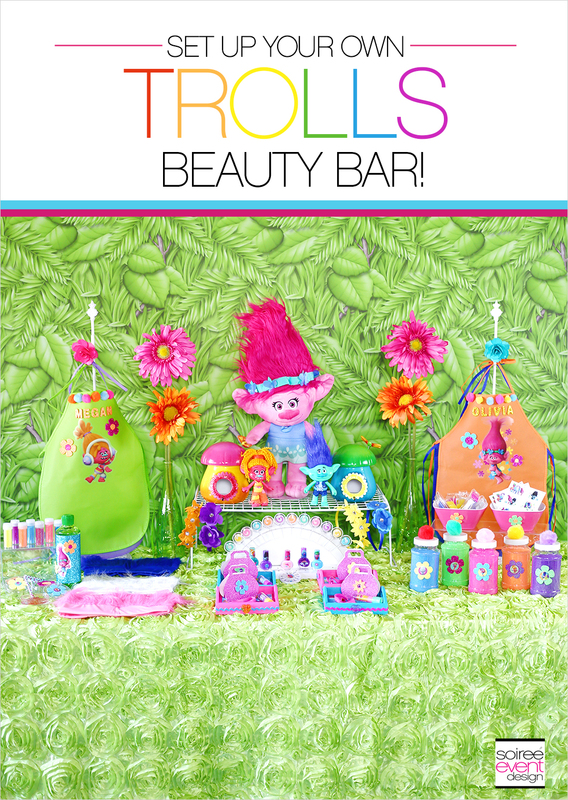 SET UP A TROLLS PARTY BEAUTY BAR! 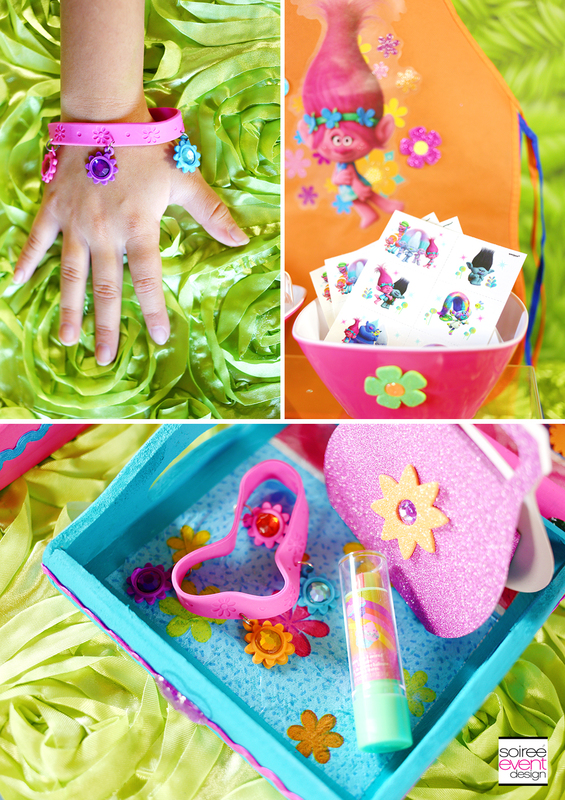 How adorable will your little party guests look when they visit your Trolls Party Beauty Bar full of beauty accessories like these Trolls hair headbands, flower bracelets and glitter tattoos. They will also have fun mixing their own Glitter Body Gel, making their own sand filled rainbow bracelets and doing each other’s nails. 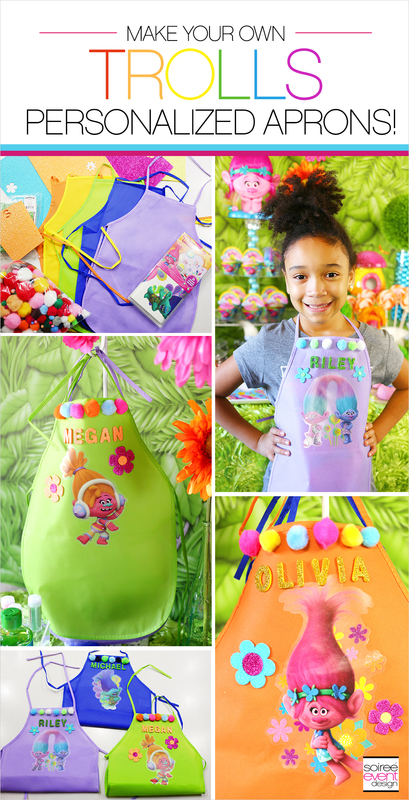 MAKE THESE TROLLS PERSONALIZED APRONS FOR EACH GUEST! Crafts can get messy, so be ready with these DIY Trolls Personalized Aprons that you can make inexpensively and give to each guest to take home. Display them on your Beauty Bar for an added touch of decor. CLICK HERE for the step-by-step tutorial and shopping list. 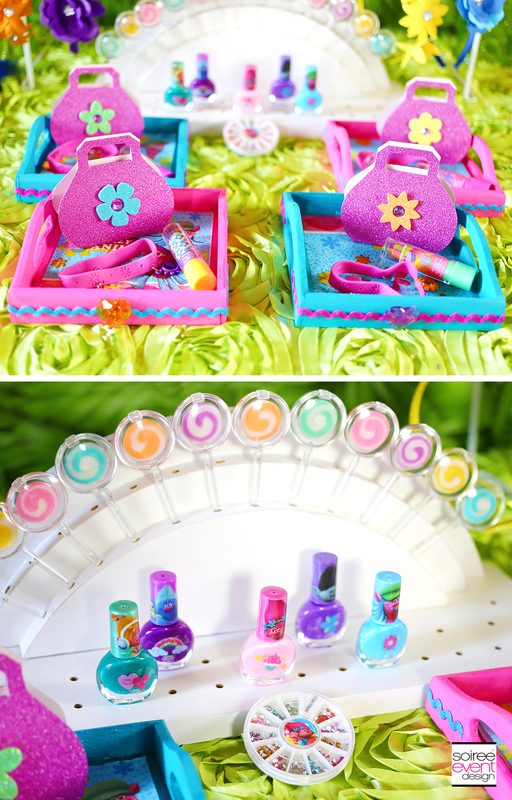 DIY TROLLS BEAUTY TRAYS MAKE GREAT PARTY FAVORS! 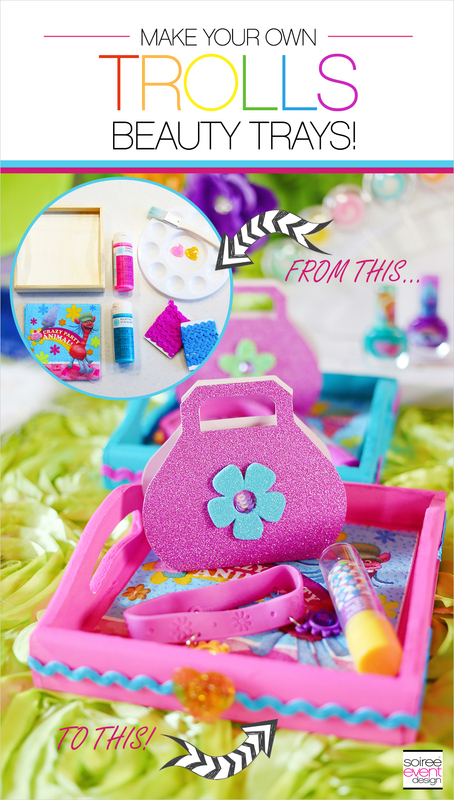 Each guest will receive their own DIY Trolls Beauty Tray which is super easy to make and makes a great take home party favor for your guests. Want to know how to make them? CLICK HERE for the step-by-step tutorial and shopping list. 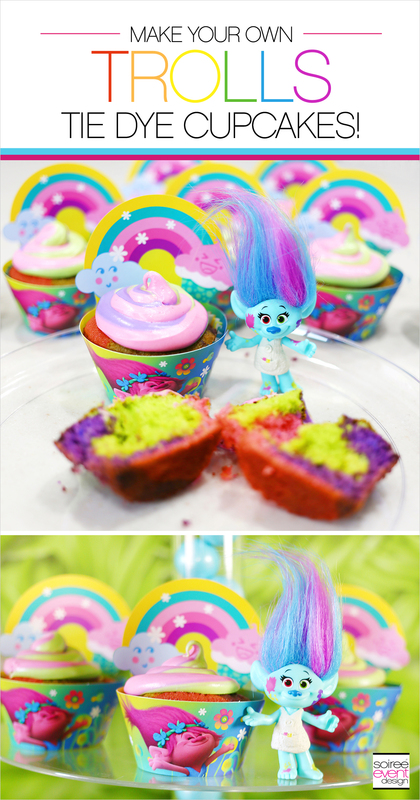 SERVE TROLLS TIE DYE CUPCAKES! How fabulous are these for a Trolls party! The explosion of colors inside the cupcake are perfect for the vibrant colors of the party’s theme. These are actually super easy to make! Want to see how to make these? CLICK HERE for the recipe. 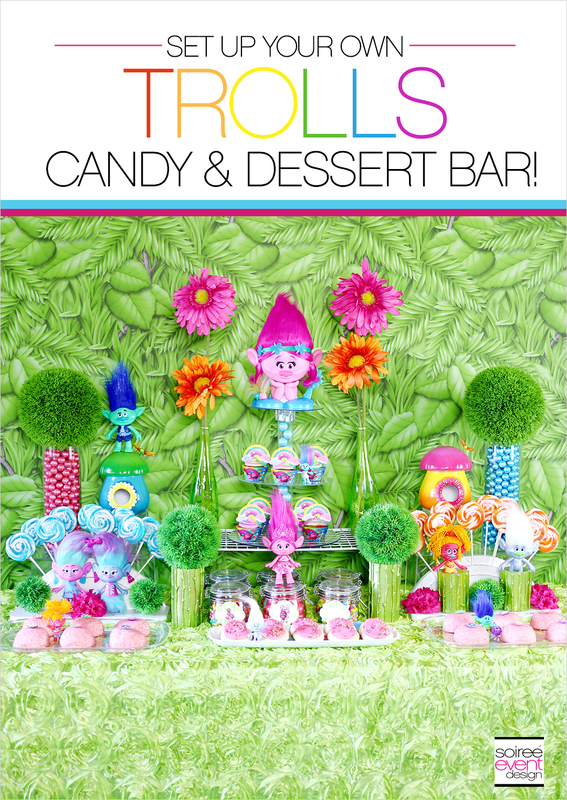 DISPLAY YOUR CUPCAKES ON A TROLLS CANDY & DESSERT BAR! Want to know how to make these? Trust me…you will THANK ME FOR THIS ONE! CLICK HERE for more details and a shopping list. Be sure to SUBSCRIBE to my blog so you can get all my blog posts delivered right to your email’s inbox so you won’t miss a thing! Subscribing is easy! Just enter your email address in the above right corner of this page and be sure to confirm your email once you get our confirmation to your inbox! That’s it! AND…you’ll get a code for 10% off your next order in our shop. FOLLOW ME ON PINTEREST FOR LOTS OF INSPIRATION! CLICK HERE to check out my PINTEREST BOARD full of recipes, parties, home decor and more! All photos and text in this post are copyrighted to Soiree Event Design and may NOT be copied from this site and used in any way without permission from the owner. Pinning images, of course, is allowed and encouraged. Tonya Coleman is a premiere event stylist & graphic designer. She blogs and shares party tips & inspiration at Soiree Event Design and is a bi-monthly contributor to Hostess With The Mostess blog writing the popular "Look for Less" and "Trend Alert" blog series. She is the author of the wildly popular "Soiree Event Design's Guide to MY Party Planning Biz!" Ebook & the "Party Planning Organizer" both must-have tools for party planners! Her unique and creative party printables are exclusively available at Soiree Event Design Shop. You can connect with her on Facebook, Pinterest, Instagram and Twitter. How cute and colorful and creative! I wish I was having a party just so I could do this! This is fabulous! My daughter really liked this movie. Looks so much fun. Cool pics. This would be a perefevt birthday party idea for little girls! Crafts colors and pretty things. I love the sand craft. Oh wow! Can I just hire you to coordinate my party instead! Brilliant! I love Trolls! Your party idea look amazing! So festive and fun! Those Troll dolls are so cute. This is a cute party idea. WOW! That looks amazing. Great pictures and great details. Thanks for sharing! Oh my goodness I love it! Wonder if they have enough boy trolls to make this for a boy? you did an amazing job at decorating! Thanks Jasmine! Well, about 5 minutes after the party was over, my 5 year old son had taken all the Trolls toys into his room and had a ball playing with them! There are a few boy Trolls that you could focus the party on. 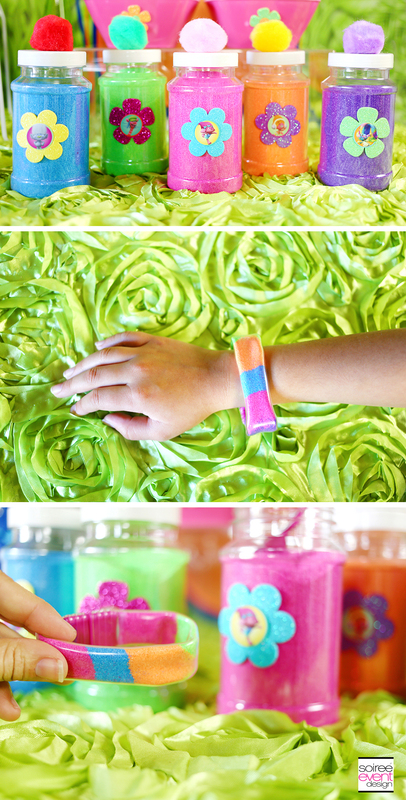 Such a totally cute and fun party idea for little girls. I bet my nieces would adore this. This is so cute! My 4 years old son loves trolls! What a fun idea. You can’t help but feel happy with your pics so I’m sure a party would be even more so. Adorable party!! Love all the activities. Riley is so beautiful! She looks like she is having such an awesome time. The decor looks so fabulous! 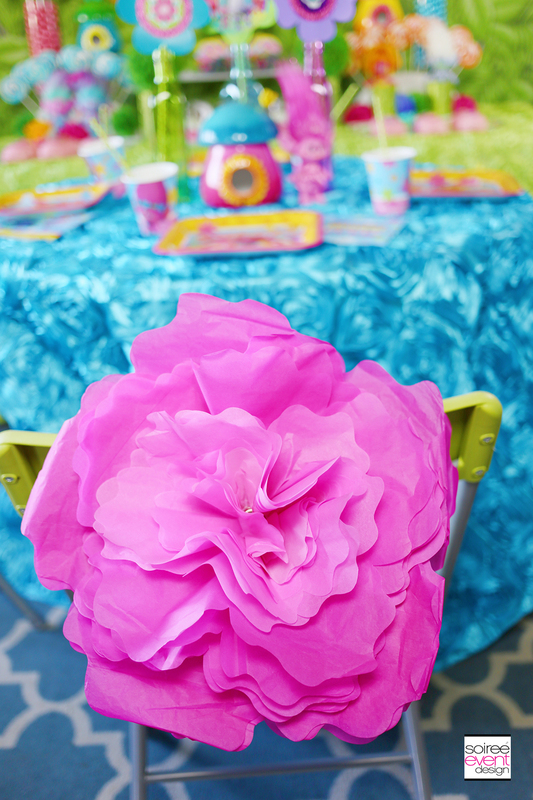 It would make any little girl’s party amazing! so cute. i’ve been obsessed with trolls since i was a child. had a whole collection. you think an adult troll party would work…lol. Such a cute party! I remember Trolls from when I was younger so to see them back again is so nostalgic! These adorable trolls are everywhere! I remember my twins going gaga over them when they were little! What a fun themed party! I bet my niece would love this too. How adorable are the details! Looks like the trolls are back in the trend! This would make an awesome party for girls! Love this creative idea! Such a cute and colorful idea for a birthday party. I haven’t seen Trolls yet but it looks like a cute movie! I love all the color! My daughter would love to have this theme for her next birthday party. So much inspiration here. Thanks Katy! I’m sure your daughter will love it! Hi Tonya! This is such a cute and awesome party. Would you mind sharing where I can purchase the cute little mushrooms? They look like little Troll houses. Please let me know as I plan to use this theme for my daughters bday. Hi Vee, thanks! I got those mushroom houses from Michael’s or Joann’s a few years ago. where did you get the green vases that look like trees and also the cupcake stand? Hi, such a beautiful display! 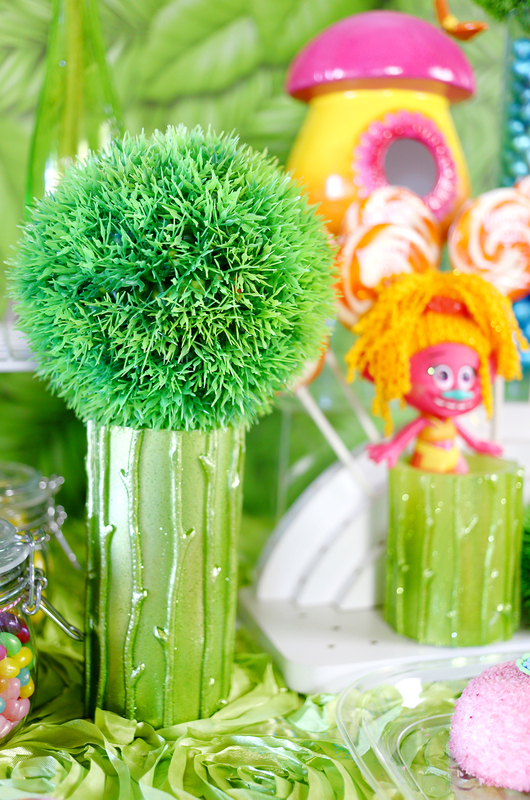 Where did can you purchase the mushrooms and the green vases that you used on your Troll candy and dessert bar? Hi again…. sorry but I noticed that you answered those questions already. Thank you for your awesome website! Where can I purchase the white candy stand.For the lollipops. Where did you get the headbands? I LOVE them and know my daughter would love it for her party this year! Hello I am planning my daughter 5th birthday and I love your ideas they are amazing. I wanted to know where you got the topper of the cupcake stand looks like it could be a toy. Hi Judy! Yes, that is a Trolls toy I bought from Target. Doubled as a surprise toy for my daughter after the party which she LOVED! Where did you get the troll hairbands?? And what are those puffy luttle pink things in the candy bar? the puffy pink cakes are actually Hostess SnoBall cakes. Just was wondering where did you get the cupcake wrappers? Hi Karisha, the wrappers came inside the Trolls tie-dye cupcake kit. I got the kit from JoAnn Fabrics. So many great ideas! My girls would love all of them, where to begin? I know a certain little girl that would love this! She LOVES this movie and her birthday is coming up! My daughter absolutely loved the movie and is a Trolls fanatic! Her birthday is later this month and we’re having a Trolls party for her at a local gym, so I’m going to keep some of these ideas in mind. Those toys are so cute! 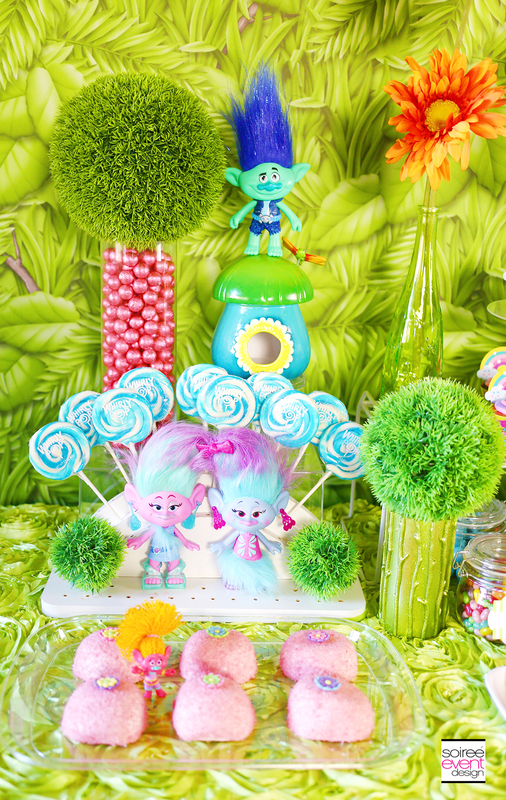 The trolls look adorable and they make up for absolutely cute party themes. 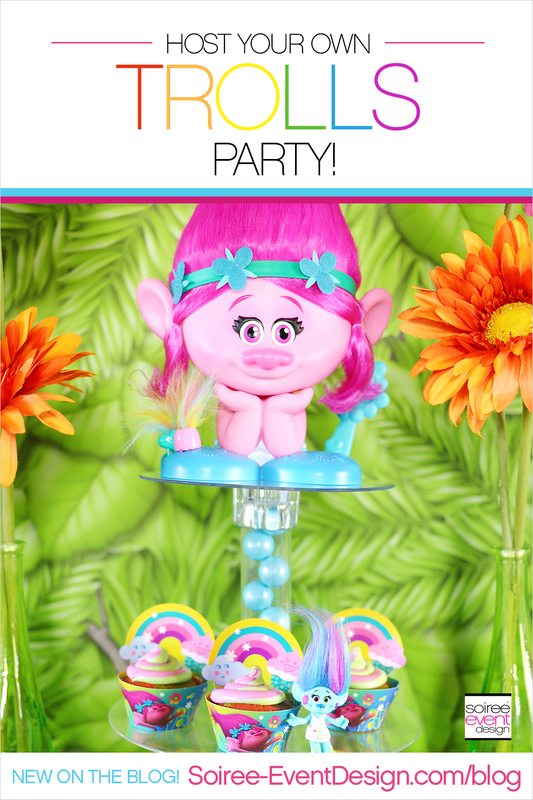 Brainstorming about party themes can be tricky, but i loved this troll party idea and I will bookmark this. Oh how fun!! 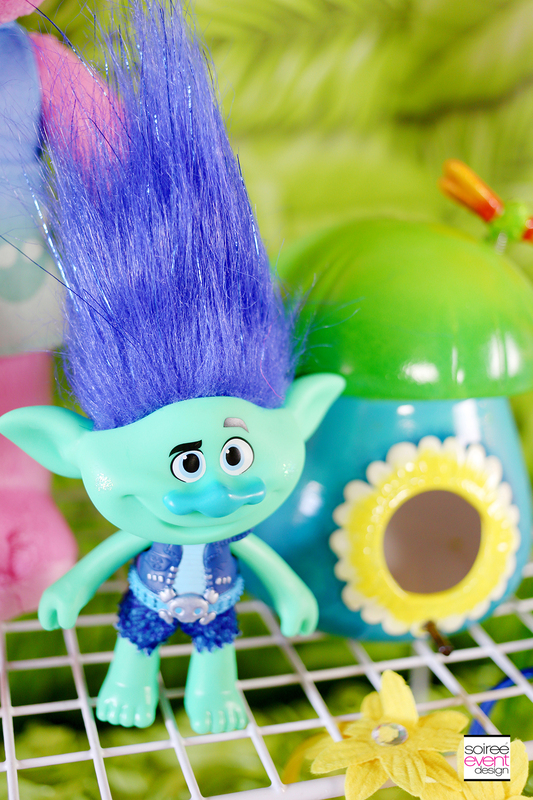 Believe it or not… Trolls were popular when I was a child. Now they’re the rave all over again and my granddaughter is in love with them. Those cupcakes are so cool. This is a great theme for a party. I will have to show this to my Daughter. Her birthday is coming up soon. 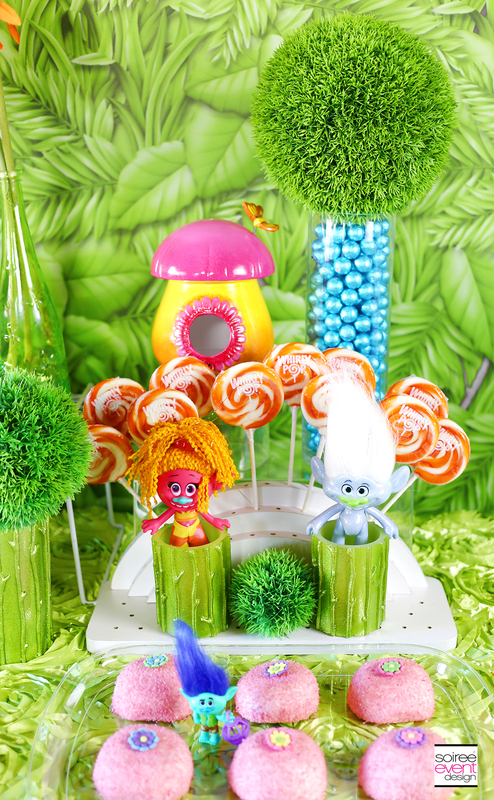 What awesome ideas for a Trolls inspired party! I love all of the bright colors and there’s no way my kids could pass up those tie dye cupcakes. Such a cute party! Love the decor and all the ideas! Such a beautiful and creative theme! What a wonderful party idea. Who would love all of that color and glitter and hair? I love trolls. 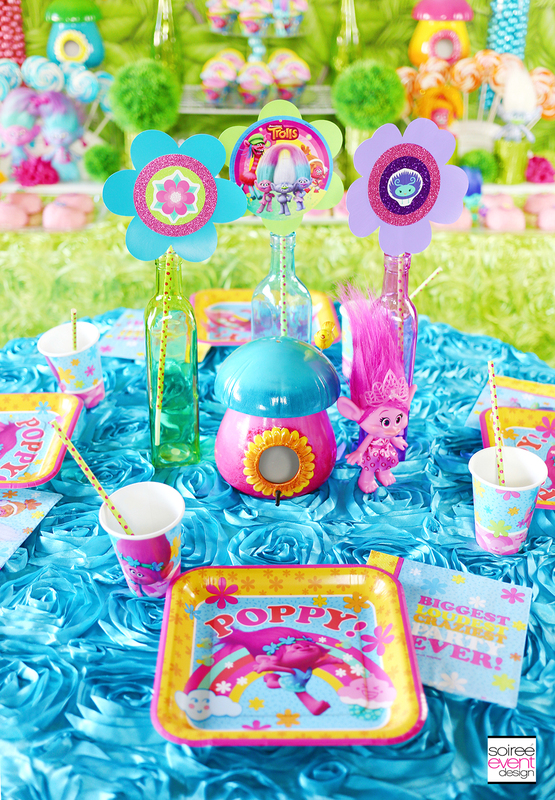 Any girl would FLIP out over this cute party theme! I love all the details especially the whole beauty bar concept. Oh, wow! This is a very cute and festive idea! I love trolls and I’ll definitely try this for our next party! So fun!! This party theme brought back memories of me and my daughter when she was still a little girl, playing with her Troll dolls and Smurf figurines! I love your design ideas. Will share this with my cousin, maybe they’d consider a Troll themed party for their little girl. There are so many amazing ideas here! This is such a cute theme party, and you made it so affordable! My nieces would go crazy for this, and I will have to show them this for their next birthday parties. What little girl wouldn’t love all the colors and glitter! Too cute! My kids are still in love with the Trolls movie. They would love to have a party with this theme. Those cupcakes look to die for! This movie is so cute! My girls would love if I throw them a Troll Party over the weekend! I watched Trolls about a month and ago just loved it. All the colors definitely lend themselves to creating an amazing display and party. Oh, the Trolls are so cute. I think my little one would enjoy a party themed in Trolls. I really love this!!! My kids would go crazy over this. I will have to make some of the things you showed here. So cute! I would like to know where can I get the clear cupcake stand and the white stand thats under it? Beautiful design and so many details. I am planning a Trolls birthday party for my daughter and came across your blog. Could you please tell me where to buy the foliage? The Oriental Trading paper roll doesn’t have the same feel as the one showed here. Hi Dani, I used the same paper roll backdrop from Oriental Trading. I also got the grass balls from there as well. Thank you so much for the ideas! I love all the greenery you included in the set up!! 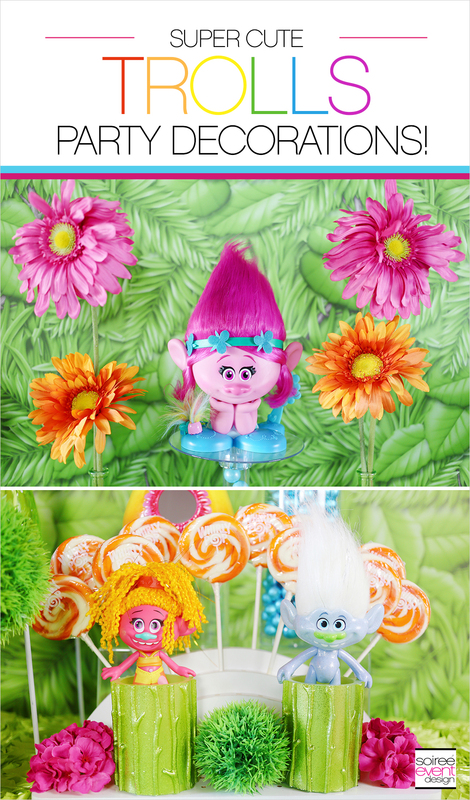 I’m hosting a Welcome Springtime Trolls Spa party for my girls.. can’t wait! Visit Soiree Event Design's profile on Pinterest. DON’T MISS A THING! Subscribe to my email list & get 10% off your next shop order!